There are few climbs a cyclist can attempt that will take them from ocean level to over 10,000ft – and this is one of them. Haleakala is a monstrous ride. The numbers are straight forward – 35.52 miles, 10,548ft in total gained altitude (the summit is 10,023ft above sea level), a temperature differential of 30-40 degrees from surf to summit, and an average gradient of 5.5% (10-12% in places). Strava says Haleakala (Pa’ia to Summit) is the “World’s longest continual uphill paved cycling course”, while oddly it is also listed as the shortest course in the world where you can go from ocean/sea level to 10,000ft. It’s the most difficult paved cycling course in the USA but ranked 2nd in overall difficulty (because the most difficult cycling course in the world – PERIOD – is one island over on “the Big Island” of Hawaii – the climb to Mauna Kea – 0 to 13,757ft over 42 miles). Mauna Kea has 7km of gravel roads which makes it a difficult climb for you have to switch from your road bike to a gravel grinder or mountain bike then back to a road bike for the climb. For “roadies” or road cyclists – Haleakala is the mountain to conquer; it’s the biggest climb a road cyclist can hope to accomplish. This guide was written to help you make the best choices in preparation so your attempt will be successful. A large majority of cyclists who set out to conquer Haleakala fail. I know several “solid” cyclists who have made as many as 3 attempts to summit Haleakala and have still never succeed in reaching the summit. A little aside – did you know that Haleakala is actually TALLER than Mt. Everest? It’s true! Both Haleakala and Mauna Kea are taller than Everest. The rub is that nearly 20,000ft of each mountain is underwater. If you measure both from where they leave the ocean floor to their summit you’ll find that Haleakala is 668 feet taller than Everest and Mauna Kea is nearly a mile taller! I reached the summit on my first attempt – but I studied the course for months, trained for nearly a year, and had some amazing companies step up and help me through equipment sponsorships. MAKE SMART CHOICES – If you’ve never done a 5 hour, 4,000+ calorie ride uphill, you really need to pay close attention to your riding habits and be honest with yourself about the choices you’re planning on making. Is it smarter to go as light as possible and save every potential watt you can so that you’ll have more energy as you hit the higher altitudes (when you need it the most)? Is the 53/39 chain ring setup you typically ride with the best choice or would a 50/34 give you a better chance at making the summit? I chose an amazingly light weight but super aerodynamic bicycle for the ride (an Eagle Z3). I stripped a full pound off the Eagle’s already impressive weight by replacing the Shimano bearings/crank for an ultra-light weight Rotor ceramic bottom bracket/crank. I saved additional wattage each pedal stroke by choosing Rotor’s revolutionary Q-Ring oval chain ring system. And I opted for a support car to carry all of the items I’d rather not strap to myself or my bike so I could ride clean – with as little weight as possible. All of it added up – a few watts here and there – to give me what I needed for a successful attempt. Pay attention to any and every choice you make as a rider and think about how you could make better choices (for the sake of energy economy) in how you approach this climb. Lastly, there are some tricky places where you can get into trouble – especially in the higher altitudes. You want someone there to help you if you need it. I did suffer from slight altitude sickness (tunnel vision, shortness of breath, headache). You don’t want to be alone and have a serious case of atmosphere sickness such as losing consciousness. If I didn’t show up at the expected time based on my typical cycling pace – they knew to come back down and look for me. KNOW THE COURSE – I studied maps, read articles others had written, watched YouTube videos, and talked with cyclists who had attempted this ride for months before I arrived in Maui. The day before my ride I drove up the course to see for myself what the road conditions were like. I made mental notes of rough patches of asphalt, tricky corners, and places where the climb got really steep. What struck me about my day before reconnaissance was just how massive – how big this mountain was and how long this climb was. It is the tallest, longest, paved uphill course in the world. And driving the course the day before helped me put all of the months of study in perspective; I had no idea how big this climb was. You’ll want to do the same thing. Stats and maps and videos and even this article cannot prepare you for how utterly BIG this climb is. You have to see it for yourself. TAKE PLENTY OF HYDRATION AND NUTRITION – I burnt through 4,313 calories on this ride – twice what my normal “long” cycling course costs me. The start of the ride is hot, humid, and the sun is relentless. You get the shakes quickly in 90 degree heat when you are riding uphill at a good clip. 20 minutes into an almost 5 hour ride I was drenched in sweat. You cannot do this course with a couple of bottles (I have a rack that holds 2 bottles on my bike). I went through 12 bottles of water, 24 ounces of Hammer Gel (non-caffeinated), 6 Cliff Gel Packs and 6 Stroopwafels (Honey Stingers). I would NOT have made the last 4 miles of the ride without everything listed above. Again, if you have to carry all of this it’s going to make for a heavy backpack and you’ll probably not make it. Attempt this climb without the right hydration and nutrition and I can promise you that you will not reach the summit. TAKE COLD WEATHER RIDING GEAR – I started the ride in a summer kit, no gloves (I don’t like to ride with gloves), light weight socks, and no thermal head protection (just my helmet). On what I am calling “the 3rd Stage” of the climb – around 5,500ft – it was cold (around 55 degrees with the wind chill factor), wet, and windy. This area of the climb, BTW, is the most common place for people to give up and turn around. There’s a reason for it… it’s just miserable. You’re in the cloud layer (if you’ve not started at the right time of day – see #6 below) and it’s wet, cold, and utterly miserable. The graph above shows the temperature (still air) as an overlay compared to the altitude gained as I rode further up the mountain. The temperature started at 90 degrees, rose to 94, and dropped to 50 by the time I hit the summit. I stopped at 5,500ft and took a break. I fueled up and changed into a thermal/water proof cycling jacket (by Castelli – it’s brilliant! ), long water proof gloves, a second layer of socks, and I put on a thermal beanie/cap under my helmet to cover my ears and keep my head dry and warm. These items helped make the next 4,500ft of climbing tolerable. Without them I seriously doubt I would have made it. BELOW – Funny the difference a few miles makes… on the left was 1 hour into the ride – the right – 2 hours. START EARLY – The earlier the better. Haleakala is so massive it creates its own weather. If you start at sunrise you’ll make it to the lower switchbacks before the clouds can form there. By 11am a thick layer of clouds starts to form between 5,000 and 7,000ft. These clouds bring much cooler temperatures, tons of moisture (often in heavy downpours), and strong winds. Hit this part of the mountain after these clouds have formed (like I did) and you’re in for a much more difficult ride. Weather is of course affected by the time of year. I did my ascent in October – for a very specific reason – it was the 1 year anniversary of my heart attack. I even started the ride at a very specific time of day (I started when my heart attack started) and I should have known this was a mistake when the staff of the bike shop where I picked up some last minute supplies as I headed out for my ride looked at me like I was crazy. October is a great month to climb Haleakala – but leave at dawn or face unrelenting heat (at the start) and misery in the middle (and to me the most difficult) part of the climb, and bone chilling temperatures at the summit. The next time I cycle Haleakala – and there will be a next time for I loved this ride – I’ll start just as the sun is coming up. IF YOU ARE BRINGING YOUR OWN BICYCLE – I have to mention one of my sponsors because they saved me from an unimaginable bad experience. Scicon Bicycle Technical Bags – It was vitally important to me that I rode MY bike on this ride. I trained on my bike and my bike was specifically tailored to me for climbing big mountains. I didn’t want to take any chance that my bike might arrive damaged. Enter Scicon – their hard-shell Aerotech Evolution TSA case is simply brilliant. Not only did my bike arrive in perfect condition – when I got ready to leave Maui I discovered (as thousands of XTERRA World Championship cyclists were discovering) that the Maui Airport doesn’t have a large x-ray machine. This means that bicycles in bags or hard cases have to be manually inspected. When I arrived at the TSA counter to check my bike in there was a line of several cyclists in front of me. There were 2 TSA agents. We were all told to “take our bikes OUT of their cases”. As everyone started to open their bags and start pulling parts out… I simply opened 4 latches and swung the Aerotech Evolution open. It is a clam shell design. 2 minutes later I was cleared, my case was closed back up and I was on my way to my gate. One of the XTERRA guys was very upset because it was going to take 20-30 minutes to go through everything and rebag his bike and his plane left in 20 minutes. He was going to miss his flight. Get a Scicon Aerotech Evolution TSA 3.0 case. Get to the airport early – I’d recommend 30 minutes to an hour. My experience with Haleakala was challenging, but in an amazing way for it reaffirmed my belief that our minds are the most powerful component in achieving success. I am not going to lie; I could have done the ride quicker. But to do so would have really pushed my physical boundaries and since I decided to assault Haleakala AFTER having a life-threatening STEMI heart attack; I figured I best not push my luck. What I found most challenging about the climb was the little battle I kept having inside my head. If you look at the ride as a whole – it is beyond intimidating. The battle for me was to stop looking at the whole and break it down into parts. In retrospect – after all of the articles, websites, and videos I’d watched as I was training for the ride – I knew that I wanted to offer anyone who wants to take the time to read all of this a different perspective on how to successfully assault this incredibly difficult ride. I’ve broken the ride down into 5 parts – I’m calling them stages for lack of a better word. I’m going to provide the little tricks and tips I would have appreciated someone sharing with me and I’ll give you some personal insight into areas of the ride I found challenging. I would love to hear from anyone who has read this article and has found this information useful. STAGE 1 – PA’IA TO HWY 377 (The Haleakala Highway): The quaint coastal town of Pa’ia is located a few miles east from Kahului (where the main airport for the island is located). I stayed in Kahului. A 10 minute ride up HWY 36 and you’ll arrive in Pa’ia. Just before you get into the town (proper) there will be a public beach to your left with free parking. Just beyond this the road splits off to the right in a bizarre little “mini- bypass” road. DO NOT TAKE THIS ROAD. Immediately past the mini bypass to the right is the Pa’ia Town Public Parking Lot. You can park here if there’s an available spot. If not take a left out of the lot and head back to the free public parking at the beach. ABOUT PA’IA – It’s your starting point. If you want to actually get the full “ocean level to summit” experience – you can walk your bike out to the public beach and dip your tires in the ocean. I passed on this… I didn’t want to risk getting my nicely lubed chain sandy. But still, many people do it. MAUI CYCLERY – Every year there’s a “Summit to the Sun” race that starts in Pa’ia and ends on Haleakala’s summit. The current official Summit to the Sun record holder is Jonathan Vaughters having finished in 2 hours and 38 minutes (2 hours and 1 minute faster than my ride). Maui Cyclery is legendary because the guy who started this race owns the shop. Mr. Donnie Arnoult is a name you need to remember. He’s the owner of Maui Cyclery and Go Cycling Maui Tours. He and his staff know all the ins and outs of Haleakala. They can fix your bike (they were removing scorpions from inside the frame of a mountain bike visiting from Arizona when I dropped in! ), help you with supplies (they have killer “I climbed Haleakala” jerseys and t-shirts), and if you don’t want to take your bicycle they will rent you a very nice road bike for your climb. BALDWIN AVE – This is the first traffic light you’ll come to in town from the direction of the beach/parking lot. Take a right onto Baldwin and this is where your climb starts! It’s a nicely paved, smooth, asphalt 2 lane road with little curves and long straightaways. In many ways it’s really a very nice ride. There’s lots of farm land on either side of the road, some pretty stone churches, a nice little stone walled 90 degree bend that’s a great photo op (my crew missed this op but hey!). The air is humid and heavy. If you don’t start early enough the sun and heat build quickly. It was 94 degrees as I rode up Baldwin Ave toward the little town of Makawao. Baldwin Ave is probably the easiest part of the entire course, but don’t let these first 7 miles lull you into a sense of feeling good about the climb. Your first challenge awaits you in Makawao. BALDWIN AVE. TURNS INTO OLINDA ROAD IN MAKAWAO – You’ll come into the little town of Makawao with it’s row of neat little shops and you’ll come to a stop light at Makawao Ave. You’ll keep going through this light – where Baldwin Ave. magically becomes Olinda Rd. Oh hell. Yep. The first real climb of the day awaits you immediately as you pass through this stop light. The start of Olinda Rd. is a 12% grade straight up over a 1/2 mile distance. In the heavy, hot, humid air it will make your legs and lungs burn. I want to note that this was the ONLY point of this entire ride that I got out of the saddle. I trained for months on a different bike than my Eagle Z3 – and had a month to get acclimated to it for this climb. The EAGLE Z3 is amazing in that the architecture, although an aero bike made for speed, is very forgiving in a climb. I am able to take some big hills and steep inclines in the saddle with this bike. The Z3’s frame is so rigid and effective at transferring power I didn’t HAVE to stand up to get into a good uphill grind except for here. Shortly after hitting the top of the hellish Makawao/Olinda hill you are given a VERY RARE gift that you won’t see again except one more time on this ride – you get a little downhill break. First you’ll climb a very gentle uphill grade for another mile then at the Maui Roping Club’s Okie Rice Arena Sign hang a right onto Hanamu Rd. You’ll enjoy a short downhill run (watch out for the speed bumps! No I’m not kidding) and before long (less than a mile) Hanamu Rd merges with Kealaloa Ave. Be sure to follow Hanamu onto Kealaloa – and DO NOT take the sharp right turn onto Kealoloa. Make the wrong turn here and you are going to be really upset for it takes you back away from the mountain. The next stretch of road is really beautiful. It was the first break in the heat I’d had since starting the ride. This stretch of Kealaloa Ave. cuts through a deeply shaded area of heavy forest. Cool breezes hit me as I rode through the thickest forest you’ll see on this ride. This extremely enjoyable stretch of road is gone too soon and you’ll find yourself facing the wide and smooth asphalt surface of HWY 377 – The Haleakala Highway. Take a Left onto this highway and start STAGE 2 of your climb! STAGE 2 – HWY 377 to HWY 378 – This short 5 mile course takes you up the Haleakala highway at a steeper course than the first 7 miles – averaging 6-7%. Haleakala is deceptive because you think 5.5% average – no problem. But you have many 7,8,9 and 10% sections – and they are not a few hundred feet. Some are several football fields long. It is relatively straight and there’s a nice shoulder. Cars are very courteous – you’ll have much more traffic here than on Baldwin Ave. This 5 mile section is the last area where you can get supplies if you need them – Around mile 13 – at around 3,100ft – tucked down on the right side of the road (the roof is visible from the road) is the Kula Marketplace. Stop here if you need anything to eat or if you need to use the restroom. The next available stop will be 12 miles up the mountain at 7,000ft. (the Haleakala National Park’s Welcome Center). 1 mile past the Kula Marketplace you’ll come up on the last turn you’ll make on your ascent – the sharp left turn onto HWY 378. This is a great photo opportunity for you’ll have a cool “Haleakala Crater 22 miles” sign in the center of the split in the road. You are at 3,329 feet altitude and you are 14.27 miles into a 35.52 mile ride. Don’t get too excited because all hell is about to break loose on you. Welcome to Stage 3! I’m not going to lie; if you can survive the next 10 miles you’ll probably complete the ride and reach the summit. The next 10 miles will see your altitude nearly double. And that’s not the worst of it. The worst of it comes in the form of weather. IF you didn’t listen to me about leaving early you are going to get stuck in some truly miserable riding conditions. The ONLY way through it is to be mentally prepared and just keep pedaling. This stretch of highway has the altitude marked with nice road signs. Every 500ft in altitude gained is marked clearly to inspire you to continue climbing. When you clear the tree line – where the worst weather awaits you – some beautiful soul (or souls) who suffered this ride long before you must have been so affected by the experience that they decided to come back with stencils and spray paint and in the worst sections of the switchbacks – where the gradient turns ugly at 8 and 9% – they spray painted inspirational messages on the shoulder of the road. I discovered a pattern. These messages appear right BEFORE the road gets ugly. Messages such as “Breathe” were a comfort to me. It let me know that someone else had suffered in the miserable sideways pouring rain where the cloud layer is so thick you can’t see 30 feet in front of you. Near the end of this stage – about a mile before you reach the gates of the National Park, you have another little section with some downhill action – it’s brief but man does it feel good. If you are smart and you start early this section would boast some truly amazing scenery of the island below you. I came back two days later to do my descent ride and had learned by then to start early. I shot the photo below (left) at around 9am. The photo to the right was shot at around noon (note I’m in the curve on my bike in this photo). There’s a big difference in ride quality between these two times. Pretty much everything else. This section was lonely. It was dark and stormy and full of all the things that cyclists hate the most; bad weather and more bad weather. CATTLE GUARDS!!!! If you’ve never experienced these widely set steel bars with empty space below them – know that they were designed to keep cattle from crossing them. So yeah – if they are wide enough to discourage a cow from stepping on it you can imagine how much fun riding a bicycle over one is. And there are several of them in this section. You’re also likely to have cattle standing on the side of the road staring at you. Just remember these guards when you come back down. Hit one off center at 30mph and you’re going to be in a very bad situation. You want to hit them directly straight on. And make sure your bottles are set down in your bottle racks. The deep vibrations caused by these guards as you roll over them can send loose bottles flying. The best strategy for getting through this stage – which is the section of the ride where most people give up and quit – is to hunker down – focus on your pedaling – and ignore the nagging little voice in your head reminding you how nice the weather is at the beach right now. Know that a great – amazing experience awaits you in Stage 4 if you can only make it through this mess. Also know – as I’ve pointed out several times now – that if you were smart and left early enough you’ll miss the bad weather aspect of this Stage. You’ll still have the rough gradients and what seems like a never-ending torturous uphill grind; but these things await you in the next stage as well. That’s the nature of Haleakala. It’s a never-ending uphill struggle. You should know that your time in Stage 3 is coming to an end when you leave the open space of the switchbacks and find yourself in an alpine forest. Another mile or so and you’ll come around a bend – the ground will level out some (a gentle 3% grade) and you’ll see the gate of the Haleakala National Park in front of you. STAGE 4 – UPPER SWITCHBACKS – When you arrive at the gate for the Haleakala National Park – you know that things are going to be OK. Not that the final 3,500ft in altitude – the next 11.75 miles are going to be easy. But it’s just that you can finally see the end – literally. If the cloud cover isn’t too thick – you can see the observatory off to the right on the summit of the mountain above you. You’re a mile from the Park Visitor’s Center where you can use the restroom and take a break. And then the much larger and gentler upper switchbacks lay above you. There are 21 lower switchbacks and only 5 upper switchbacks. These upper switchbacks are much gentler – averaging 5%. The roads are not near as nice. These are Federal Roads and they are rough. Old, cracked, bumpy asphalt is all you will find in this section of the climb. There are no guard rails and the shoulder is practically non-existent. You could (in several places) go off an embankment over the side of the mountain to your death – or at best a nasty crash with broken bones and a crushed bicycle. There is little wiggle room so you have to pay attention to the traffic coming up behind you. The good news is that every driver I encountered was polite and gave me the 3ft distance required by federal law. Many gave me “Shaka” (hang 10) hand signs out the windows of their cars. Some honked – not rudely but as a sign of respect. And others yelled encouragement out their windows for making it to this point is no small feat. The air gets noticeably thin around 8,000ft but you come out of the cloud layer (if you’d been unfortunate enough to get caught in it). Even though you’ve come out of the clouds into the sun again, it’s noticeably colder and the wind is much stronger. At around 8,000ft you get an amazing reward for having toiled through the lower switchbacks; you come out above the clouds and the view is unlike anything on this Earth. If you saw the movie “Oblivion” – the amazing skies that surrounded Tom Cruise’s “sky tower” were shot at the summit of Haleakala over a 3 week period. The view is simply stunning. I honestly can’t remember anything about this section of the ride except how beautiful the landscape above the clouds was and how pleasant the gradient of the climb had become. The only issue for me became how much thinner the air was. 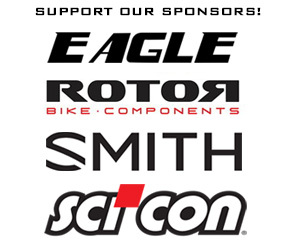 This is where I want to thank another sponsor – Smith Sport Optics – for being so supportive but additionally, for designing the best cycling helmet in the world (in my humble opinion). The Smith Podium TT helmet is light weight, comfortable, and has interchangeable windscreens. It comes with a clear windscreen and with a red mirrored windscreen featuring Smith’s innovative “Chroma-Pop” lens technology. What you get is super crisp imagery with the best UV eye protection available. That helmet kept me cool in Pa’ia, warm in the last 3 stages, and protected my eyes in both dark/rainy and ultra-bright sunny conditions. Before long you are staring at a sign that says “9,000ft” and your time in Stage 4 has come to an end! There are no more switchbacks. You can see the white domes of the observatory off in the distance before you. This last 2 miles nearly took me an hour to complete – my lungs completely gave out on me. The lack of high atmosphere conditioning is killer at this altitude with this much exertion. I’d pedal a few hundred feet – get tunnel vision – and stop to catch my breath. My head was pounding at this point. The last 1/2 mile to the summit is a brutal 10% grade – it’s honestly the worst thing you’ll encounter – not because it’s so bad. It’s not. The asphalt is new and pristine. It’s about 300ft over 1/2 mile. It’s just that you have no energy, no oxygen, and if you are like me – you’ve just blasted through 4,300+ calories and you’ve simply got very little in the tank. Don’t give up. Take your time. There’s no rules against stopping to catch your breath. These are the words I kept telling myself. Forget that with some additional high atmosphere conditioning I could have finished in under 4 hours. That aside… I took this last 2 miles slowly, at a safe pace to ensure I’d finish them. And there’s no feeling like making it to the summit. You come into a circular parking area and directly in front of you there’s a little curb and a rough asphalt pathway made specifically for cyclists that winds back around to the actual summit and the welcome building there. If you don’t pay attention and notice this little dark patch of pavement you might mistakenly shoulder your bike and walk up the tall set of stairs to get to the summit. No need to do that! You can ride all the way up. And actually it’s an easier path to go. Those stairs are steep! If you stop as you are entering the parking lot – this is a great place to get a shot of you with the clouds behind/below you. Some people hoist their bikes up above their head. I didn’t feel up to it. I was beat. I decided to go with the – look how strong I am – flex your arm muscle pose. In all it’s an amazing feeling. And you’ve earned it – inch by inch. Haleakala is a serious test of endurance and strength (mental and physical). Now that you’ve finished your climb you can opt to cycle back down. I decided to hang out, make some videos (thanking sponsors and friends who had been so supportive) and do some photos. Coming down Haleakala is extremely fun. You can rent bicycles just to ride down. You’ll see vans with dozens of mountain bikes strapped to their roofs riding up the mountain in the morning. What they won’t do is enter the park. These people (who pay to ride down the mountain) don’t get the full summit to base experience. They start below 7,000ft in Stage 3 – the lower switchbacks. It’s still an impressive ride. But it’s not the full experience you get when you cycle to the summit and then cycle back down. WORD OF WARNING – Make sure your road bike is in top mechanical condition. I hit speeds up to 48mph coming down. I averaged 37mph (2 mph above the speed limit). I didn’t need to worry about moving out of the way of cars coming down behind me – I was moving faster than they were (as you’ll see in the video above – my support van followed me down with a GoPro mounted to its windshield filming me). Breaking is of vital importance. Most rim-brake bikes will not be suitable unless they are fitted with direct mount brakes (my Eagle is again a brilliant design – it features direct mount caliper brakes which are much more efficient and powerful than standard mount calipers), or hydraulic caliper brakes. Disc brakes are ideal. You HAVE to pay close attention to the upper switchbacks. That road is less smooth and can be wet and/or have patches of sand that has blown into it. Hit a thick sandy patch in a turn at 25mph and you will fly off the road and if it’s in the wrong part of a switchback – right off the side of the mountain. Any crash above 20mph is ugly. On this mountain such a crash could be deadly. If you are not absolutely comfortable controlling your bike at high speeds, take it slowly. You’ll heat up your brakes, but best to go slower and be safe than to push yourself outside your comfort and safety zone. Once you make it through the park gates the smooth, wide asphalt of the lower switchbacks and the roads coming up to the mountain are a welcome change. Much smoother and easier to control your bike on, I really loosened up and started enjoying the ride. In all, Haleakala is simply an amazing experience and one you should certainly have on your cycling bucket list. Maui is beautiful, the people there are genuinely kind and friendly, and the roads are simply a joy to cycle on. It’s a cycling paradise.